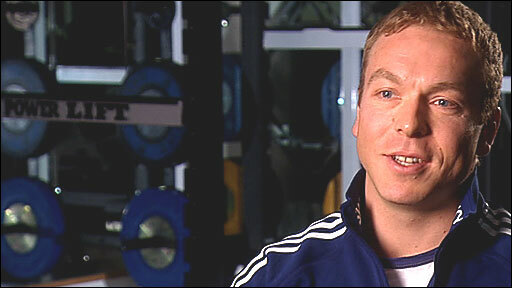 Olympic champion Sir Chris Hoy says winning gold medals at London 2012 is a bigger priority for Britain than at the world track cycling championships. The event begins in Poland on Wednesday but the three-time Beijing champion will miss out because of a hip injury. Victoria Pendleton is the only defending individual world champion in the Great Britain squad. "We want to win everything we start, but it's not necessarily about the gold medal count," he told BBC Sport. "It's more the process of the next four years leading up to London and really looking towards building a solid foundation and surpassing what we did in Beijing." Hoy's fellow Olympic gold medallists and defending world champions Bradley Wiggins and Rebecca Romero will also be absent in Pruszkow, with Victoria Pendleton the only Briton travelling to defend an individual title. But their absence will give Britain's younger riders like Matt Crampton and Dave Daniell the ideal opportunity to shine at a major international competition. Jason Kenny, who came second behind Hoy in the Olympic sprint and took gold with him in the team sprint, also has the chance to step out of the shadows. "There is so much talent coming through, there is a definite influx of new riders coming through, which is just as important as the medal haul," said Hoy, who won two gold medals, in the 1km time trial and keirin, at the 2008 World Championships in Manchester. "It's a really exciting championship for the British team. Jason Kenny has already shined at the highest level, while Matt won the keirin in Manchester [in the World Cup in November 2008]. "Dave Daniell has produced some great rides in the one kilometre time-trial." The Scot faces eight weeks out of action before he can return to training following his spectacular crash during the keirin final at the World Cup event in Denmark last month. And Hoy admitted it will be "frustrating" to watch this year's competition as a spectator. "I will watch a bit of them and then not want to watch for a while," he said. "But I will record it and watch the races in the future for a technical point of view to analyse your rivals and seeing what they are doing."